Al Yah Satellite Communications Company (Yahsat)', a wholly owned subsidiary of Mubadala Development Company, signed in August 2007 an agreement with a European consortium comprising of EADS Astrium /Thales Alenia Space to manufacture an US$1.66 billion dual satellite communications system in time for a launch in the second half of 2010. The turnkey contract gives the go-ahead for the consortium to use its resources and expertise to design and construct Yahsat's two satellites from design concept to post-launch. Both satellites were launched within months of one another, allowing Yahsat to provide customers with innovative solutions for broadcasting services, internet trunking via satellite, corporate data networks and backhauling services to telecom operators. The Yahsat satellites will fulfil the satellite communication requirements of both government and commercial customers in the Middle East, Africa, Europe and South West Asia. The system is designed to accommodate the trends of emerging applications in the satellite industry like HDTV and other broadband satellite services. The operational life of the satellites is estimated at 15 years. The Yahsat system will comprise of a space segment including two operational satellites - YahSat 1A and YahSat 1B. Yahsat 1A is to be stationed at the orbital position of 52.5°E. 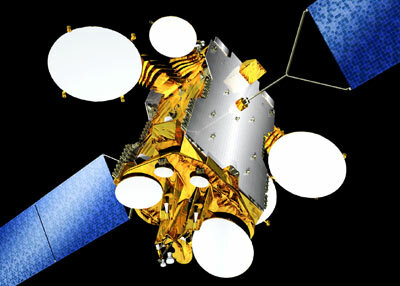 Both YahSat 1A and YahSat 1B will be Astrium's Eurostar-3000 models. The payload comprises a C-band (eight transponders of 36 MHz and six of 54 MHz) and Ku-band (up to 25 active transponders) civil payload, as well as a Ka-band military payload. Y1A is equipped with a total of 9 antennas, 4 of which can be deployed and 3 of which can be pointed. The spacecraft will have a launch mass of 5965 kg and an electrical power of 15 kW.